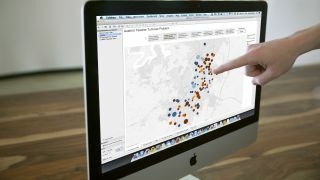 We're proud data geeks at Tableau, and each year we put our brains together to look forward at the trends we expect to see during the coming twelve months. Our predictions for 2014 included data moving from specialists to the everyman, the mainstreaming of cloud business intelligence, and the rise of NoSQL. What will be trending in 2015? Read on for our top 10 predictions for the BI market in 2015. Just as the business intelligence landscape has transformed from static reporting to interactive, self-service data, so too must governance transform. Simple approaches like locking down all enterprise data won't work any longer—nor will the approach of doing away with any process at all. Organizations will begin to investigate what governance means in a world of self-service analytics. New processes and best practices will emerge to keep data secure while letting business people get answers from that data. In 2014 we saw organizations begin to analyze social data in earnest. In 2015, the leading edge will start to take advantage of their capabilities. Tracking conversations at scale via social will let companies find out when a topic is starting to trend and what their customers are talking about. Social analytics will open the door to responsive product optimization. And as a result, the social advantage of the leaders will make their competitors feel that these companies have an eerie ability to see into the future. Today's data analyst may be an operations manager, a supply chain executive or even a salesperson. New technologies that provide ease-of-use and browser-based analytics let people answer ad-hoc business questions. While there will still be Data Analysts and Data Scientists for the heavy lifting, sophisticated data analysis will trickle into day-to-day activities. Companies that recognize this as a strategic advantage will begin to support everyday analysts with data that's easy to get and tools and training to help them do what they're doing. The consumerization of IT is no longer theoretical, it's a fact. People use products that they enjoy using, and analytics software is no different. They want to engage and learn with other users, inside and outside their company. Companies whose products inspire and empower are seeing their communities flourish. And prospective customers will also look to the health and happiness of product communities as important proof points in crowded marketplaces. The last 10 years have seen a massive amount of innovation across the data space, resulting in mixed environments for everything from data storage to analytics to business applications. We won't see a return to the age of monolithic systems. However, organizations are losing patience with multiple logins and clunky processes to move and manage data. In 2015 we'll see more organizations adopting systems like single-sign on, and less room for applications that don't play well in a larger ecosystem. People will no longer accept manual integration and data quality efforts. Rapid integration leveraging simple interfaces is going to become the standard. In 2015, we'll start to see the first major use of cloud analytics--- for on-premise data. Until now, cloud analytics have been primarily used for data in cloud apps. In 2015 companies will begin to choose the cloud when it makes sense for their business case, not only because the data is there. We are starting to see an age when data is accessible and interactive enough that it can become the backbone of a conversation. Now that people have flexible, speed-of-thought analytical tools, they can quickly analyze data, mash it up with other data and redesign it to create a new perspective. Meetings can become more engaging as people explore data together rather than plod through a set of slides and take down actions for later. And as a result of this collaboration, organizations will get more insight from their data. The arrival on the scene of Vox and continued ascendance of sites like fivethirtyeight.com will force more newsrooms to integrate data analytics into their online presence. Readerships will no longer be satisfied with just text. Interactive charts and guided stories becoming more vital for the mobile generation, and an important pre-election year in the US will accelerate people's taste for data. This trend will have a spillover effect from the public sphere to organizations, encouraging companies that are lagging in analytics to get with the times. Workers are spending less time at their desks. But that doesn't mean they should be less informed by data; in fact they have a greater need for data than ever before. Mobile solutions for many analytics emerged years ago and are finally reaching a level of maturity that means that mobile workers really can do light analysis from the road. And the emphasis on mobile has forced vendors to offer more natural and intuitive interfaces across the board. Advances in graphical, intuitive modeling will mean that business users can begin to use predictive analytics without the need for extensive expert consultation or scripting. As self-service analytics becomes more mainstream, more advanced analytics such as basic forecasting will become a more common – and less painful-- activity. Strong products will allow self-service modeling and add intuitive feedback that gives users enough information to understand the pitfalls of their models. The bottom line is we expect to see more and more people - from students to business people to journalists - make data a part of their lives. The way people interact with data is changing fast, and mostly for the better.